Feeling stressed and run-down? One of the most common problems that people experience today is having to do too much in too little time. Long hours at work and even longer commutes mean that we have less time to spend with family and look after ourselves. The best solution is to stop and get some rest, but in real life that’s not always possible. So is there anything else you can do to keep you going until you can take a break? 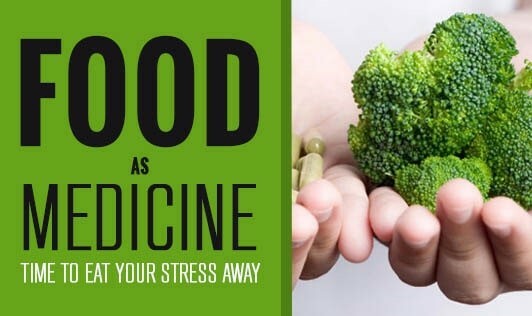 Many of the foods we eat have an effect on how we feel and how well we cope with stress. When you feel stressed, your body thinks that you are facing a physical emergency and it prepares the body to fight or run away from the danger. If this goes on for a while it puts a strain on all of the body’s systems and can increase the demand for certain nutrients. Making the effort to get some healthy food into your body can make a big difference on how you feel when you’re under pressure. Go for carbohydrate foods that are slowly digested. Carbohydrates get broken down to sugar in the blood but slowly-digested carbohydrates keep blood sugar levels steady for longer, up to 5 hours after eating. This means concentration and energy levels stay high and consistent. Eat healthy fats that do good to your brain. Choose foods such as shrimp, clams, tuna, catfish, cod, and spinach as they are high in omega-3 fatty acids. Alternatively, you can also choose healthy vegetable fat sources like avocados and olive oil that help increase the HDL (good cholesterol) levels. Never skip breakfast. A nutritious breakfast will help you meet your daily requirements of vitamins and minerals, and give you enough energy to stay productive throughout the day. Moreover, people who eat a good breakfast tend to have fewer cravings and eat less throughout the day. Eat antioxidant-rich foods such as cruciferous vegetables, leafy greens, and herbs and spices. Antioxidants help recycle glutathione in the body, a molecule that helps reduce the effects of stress. Try magnesium-rich foods. Post a stressful event, the body takes a while to get back to a relaxed state. Magnesium helps with this by calming the nervous system and makes the body less prone to the effects of stress.